We are excited to bring you Round 3 of the Super Hooligan National Championship (SHNC), in conjunction with the American Flat Track (AFT) Grand National Championship. 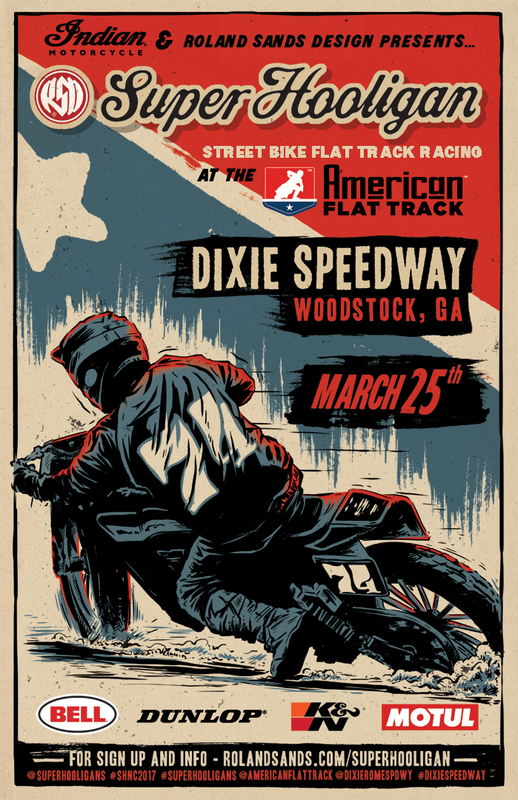 Atlanta Short Track at Dixie Speedway in Woodstock, GA on March 25th, 2017. We have a limited amount of spaces available, so get your entries in ASAP if you want to be part of the Super Hooligan show. We’ll be included in the NBC Sports Network televised racing action with AFT. Dixie Speedway is a banked, 3/8-mile track on Georgia red clay that you won’t want to miss. Indian Motorcycle will be providing a $1,000 Super Hooligan purse, along with Dunlop’s $1,000 Dash for Cash and other contingencies and prizes from RSD, Bell Helmets, Dunlop, K&N and Motul USA. GNC flat track race bike and a $2,500 bonus from Bell Helmets. Let’s get Western in the South!